Florence's central station is called Firenze Santa Maria Novella (look for signs announcing "Firenze SMN"). 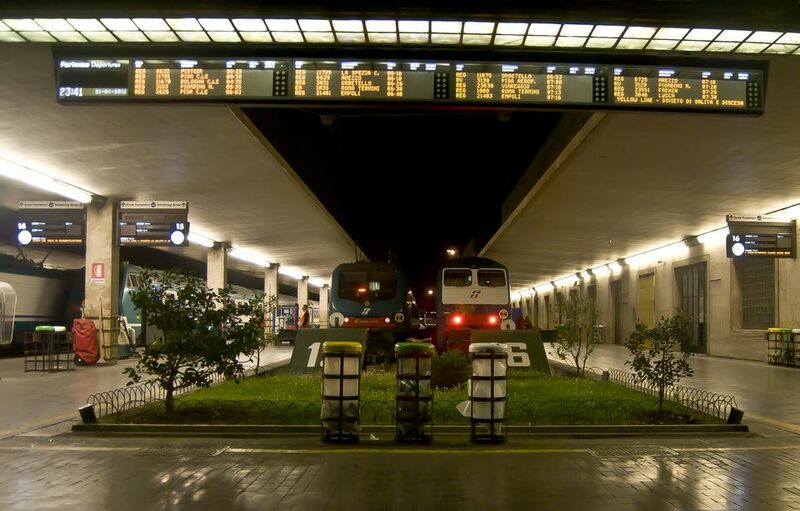 The train station is located in the northwest corner of central Florence, within convenient walking distance of most Florence tourist attractions. Many services, including two internet points, are located within the station. You can stash your luggage at the left luggage facility on the ground floor. You can go underground to reach the CONAD grocery store, where you can get snacks to go. The SITA bus station is just to your right if you've exited the station and orient yourself facing the Santa Maria Novella church. See the map in the upper right. Florence's main train station, Firenze Santa Maria Novella, is located in the historical center of Florence. Most tourist attractions are within walking distance of the station. This is likely the place you want to end up in order to start your vacation. It's a busy place. Nearly 60 million people a year pass through it. Many high-speed trains originate at Firenze SMN. Visit the website for pricing. Most of the important city buses (orange) stop across the road from the station on Via Valfonda. There is also a taxi stand is located outside the main entrance to the station, where you'll also find the Florence Sightseeing Bus. There is a tourist information office to the left as you exit the station from your train. It's open from 8:30 a.m to 9 p.m. You can book a hotel there for a fee. The train information office is on your right across from track five (binario 5). Near Track 16 is the left luggage, open 6 a.m. to midnight (subject to change). You can buy tickets at the Salone Biglietti, or try using the automatic ticket machines. Expect long lines, especially during tourist season. I try to buy tickets for my outbound journey shortly after I arrive in Florence, since lines can be long. Ticket windows (sportelli) are open from 7:30 a.m to 8 p.m. (subject to change). If you possess a regional ticket good for several months, be sure you at the yellow machines before boarding your train. There is a large fine for not doing so. If you forget, try collaring a conductor on the train as soon as you can and explain your situation. There is still a fine, but it's better than the 50 euro fine for riding without a validated ticket. Florence has two other, smaller railway stations, called Campo di Marte Station and Firenze Rifredi Station. If you wish to arrive in the center of Florence, you will want to skip them and arrive at Firenze Santa Maria Novella Station. Signs will usually say "Firenze SMN." SITA Buses will take you to many destinations in Tuscany. The price is about the same as train travel, except that, in some cases, the buses are more convenient, especially if you don't have a lot of luggage and want to get to the center of town. For example, Siena's train station is outside of town, but the bus takes you to the city center, so the bus is the recommended way to go.